It’s impossible to make a movie about a militia without at least a faint aroma of the political. It’s not even an “...in the age of Trump” issue; heavily armed right-wing paramilitary organizations of the type depicted in The Standoff At Sparrow Creek have been hovering in the background of the American cultural consciousness since at least the ’90s, when the Ruby Ridge standoff of 1992 brought these sorts of white male terror cells to the fore. Of course, depiction is not the same as endorsement, and although someone with the same paranoid mindset as the characters in The Standoff At Sparrow Creek might undoubtedly find romance in the film’s apocalyptic masculinity, writer-director Henry Dunham keeps the specifics of the group’s politics vague. Aside, anyway, from their intense hatred of police and a belief in an ambiguous-yet-imminent apocalypse. But rather than defanging the story, sanding down The Standoff At Sparrow Creek’s political implications foregrounds its exceptional dialogue and strong performances, revealing the lean, punchy, beautifully shot ’70s-style thriller underneath the controversial premise. (It should be noted that this film comes from producer Dallas Sonnier, a specialist in provocative pulp who’s also a driving force behind S. Craig Zahler’s forthcoming Dragged Across Concrete.) James Badge Dale stars as Gannon, an embittered ex-cop who, as the film begins, is startled in the middle of a hunting trip by the sound of automatic gunfire in the distance. Sensing trouble, he climbs in his truck and sets off for the rural lumber warehouse where he and the six other members of an unnamed Texas militia get together every week to grouse about the government. There, he’s informed that someone has shot up a police funeral with a modified AR-15—firepower that only the the militia possesses, at least locally. An impromptu inventory of the group’s armory reveals a missing AR-15, as well as missing body armor and hand grenades. The code to the armory is changed every 48 hours and known only to members of the militia. So the group’s leader, Ford (Chris Mulkey), deputizes Gannon, who was a celebrated interrogator before quitting the force, to get a confession from the shooter, who must surely be one of their own. Taking place almost entirely inside a single location, the film is propelled by its dialogue, which is crafted with a smart, sarcastic tough-guy flair reminiscent of a pulpier David Mamet. Supporting players Patrick Fischler (as smartass schoolteacher Backmann) and Happy Anderson (as combative ex-Aryan Brotherhood member Morris) make a particularly hearty meal of Dunham’s dialogue; Anderson gets one of the film’s best one-liners when he quips, “So you’re not a suspect because your car’s covered in blood?,” in response to Gannon’s assertion that he was out hunting all afternoon. Dunham also shows flashes of self-awareness and even self-depreciation through the character of school-shooter-in-training Keating (Robert Aramayo), whose obsession with The Catcher In The Rye and grandiloquent monologuing underline the intellectual vanity behind the characters’ worldview. 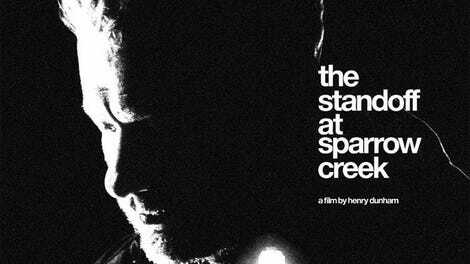 At a tight 89 minutes, The Standoff At Sparrow Creek is efficient and straightforward in its plotting; aside from one scene flashing back to Gannon’s undercover work, the story is entirely linear. Along with the hushed sound design, the modest scale produces a surprising intimacy, albeit an intimacy delivered with a low, full-throated growl. Cinematographer Jackson Hunt, meanwhile, uses moody, blackish-blue shadow and deep linear perspective to create a yawning emptiness that contrasts nicely with the conspiratorial tone of Dunham’s script. Yes, they’re still making them like they used to—maybe not the best thing when it comes to militiamen, but a good when it comes to movies.